Algae of all varieties is a type of plankton. Water with an abundance of sunlight and nutrients causes algae to multiply in size and quantity. 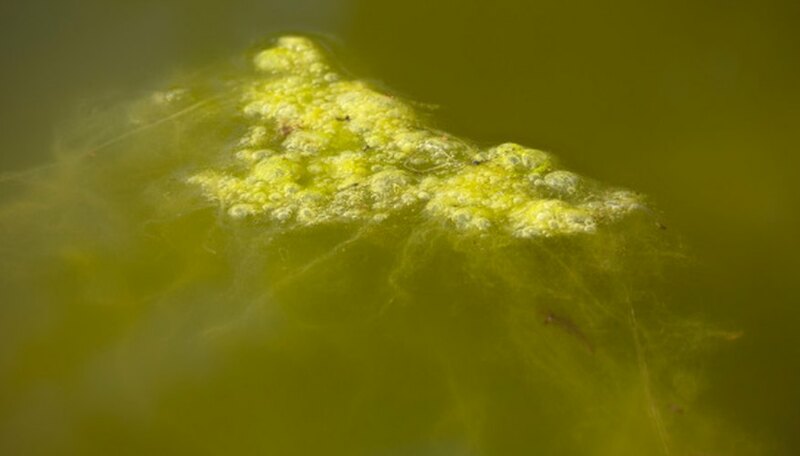 The resulting visible algae is called a "bloom." Algae blooms devour available nutrients and smother other aquatic plants, eventually causing lasting damage to a pond's ecosystem. Combating algae over the long term requires alteration of the algae-inducing elements of the pond, but for the short term, you can skim algae from the surface of your pond. The nutrients that algae consumes remain inside the plant, and algae's high nitrogen and potassium levels make it a great fertilizer. Allow the algae to grow until it forms mats or clumps on the surface. Algae typically thrives in the late summer months. Put on a pair of gardening gloves. Don a pair of hip waders if the pond is large enough to require walking into the water to reach the algae. Set a large bucket or barrel at the edge of the shoreline to collect the algae. Skim the algae from the surface of the pond using a large fine-meshed net. Use hardware cloth stretched between two poles, suggests the Penn State University Cooperative Extension. Deposit the algae in a bucket on the shoreline when the net is filled. Continue until all algae is removed from the surface of the pond. Dump the algae on the ground away from the pond. Rinse the algae to remove any excess salts. Chop the algae into smaller chunks if desired. Compost the algae or mix it into the soil around plants to act as an organic fertilizer.